"Mostly I don't know where to start. I like to look at all of the pretty scrolls but I don't know what basic supplies to get to start trying." It certainly sounded like me when I first started, and even though I have an art background I had no clue how to get started or what supplies I needed. I spoke with a few people, found a few online scribal communities, joined some email lists, and asked a few questions. There was however a lot of trial and error and although I've gained confidence and skill I still remember those first tentative steps, so here are my recommendations for beginners on the types of tools and materials to equip themselves with. Firstly, buy the tools and materials that YOUR budget will allow. Also, remember that materials (and by extension your art) end up being very personal, so what one artist loves another one dislikes. These recommendations are just MY opinion, try different tools and materials as your time and budget permit - if you love them, great. If not, then try something else until you find something you do like. 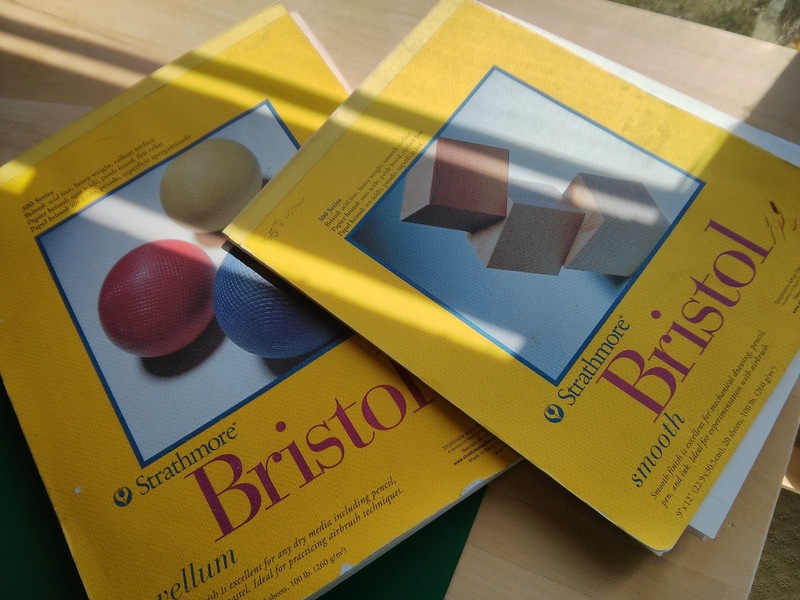 Strathmore 300 Series Bristol Board - In reality it's just thick, multi-medium paper and comes in a smooth or textured finish. The smoother finishes are much nicer for calligraphy. It can usually be found in local arts and crafts stores, various online stores also carry it. Look for “acid-free” paper to prevent degradation over time. I have both a 9 x 12 and an 11 x 14 pad, one in the "smooth" finish and the other in the "vellum" finish. Both have successfully been used to complete scribal assignments. Artist Paint Brushes - You'll want to build a selection of small, "round" brushes that have a point. Look for brushes that have at least one "0", preferably multiple "0000" or "3/0" - that's their size. Synthetic hair is fine, and cheaper. "Gold Scepter" is a brand that springs to mind that is readily available in the smallest sizes and perform very well. 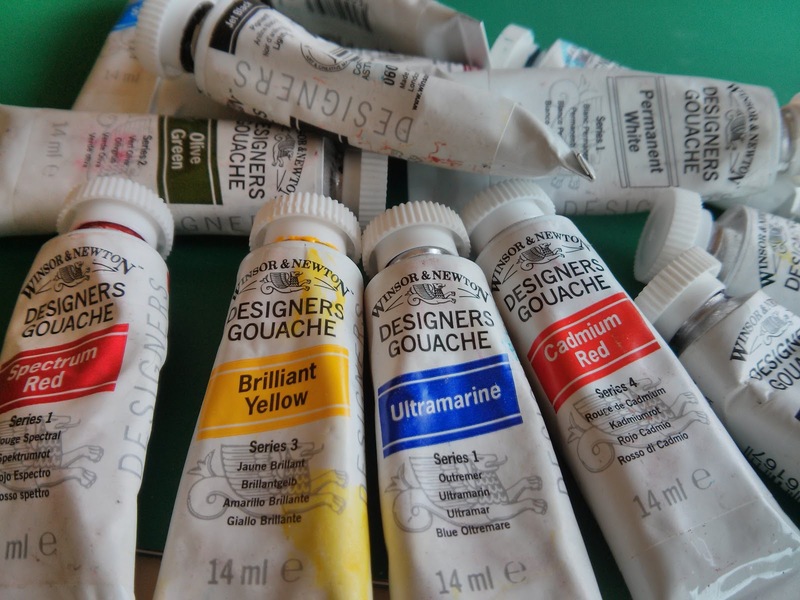 Artists Goauche - I am a fan of the Windsor & Newton goauche ("artist" or "designer", rather than "student" grade). However there are other brands, for example I hate the W&N gold but I LOVE the Holbein brand counterpart (Pearl Gold - G641). 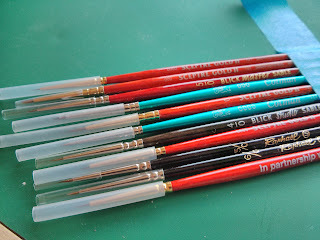 I will say that if you're going to splurge on anything, gouache should be that thing and as a very general rule, the more expensive the tube the higher the pigment concentration. You can usually buy basic colour sets, or you can buy individual tubes of the colours you need. Try to stick to one manufacturer as much as possible so that the ingredients don’t “fight” over time. When I first started, I just bought individual tubes as I needed them and initially found the following W&N colours to be the most useful - "Ultramarine", "Brilliant Yellow", "Cadmium Red", "Permanent White" and "Jet Black"
Personally I find the "student grade" paints chalky so they end up looking pale or weird on the page. This is a personal gripe I have from my college days though, others may disagree with me. Pens for Calligraphy - You can usually buy basic calligraphy nibs and holders in sets at the art store. Speedball brand is probably what you will find and they do the job just fine. Each set will have a variety of nib sizes to create different size letters, but make sure at least one of the nibs comes to a fine-point so that you can use it for drawing the lines for your art work. Ink for Calligraphy - Art stores will usually carry a large selection of inks in various colours. Sometimes, you'll get lucky and find "Iron Gall Ink" or "Oak Gall Ink". If your store carries either of these then buy it and take pride in the fact that you have your first (depending on the recipe and production) period artist material. Iron Gall Ink is my default and I very rarely use anything else because I love the way it flows from my nibs. Now, I haven't personally seen Iron / Oak Gall Ink sold in any of the stores I've been in (I buy it online), therefore my other beginner recommendation for dip-pens is Sumi black ink. It comes in a bright green, heavy plastic bottle with a black cap and the ink itself has a nice viscosity to it. A word of warning though, it is very corrosive on your nibs if you don't clean them properly. It's very black, and works really well for line-work. You can also find this ink in red (red bottle, black cap). Pencil - Used for sketching out your artwork and drawing your calligraphy guidelines. When you're at the art store you'll notice that they are graded, "B's" with a higher number being the softest through "HB" which is the middle and then into "H's" which are considered hard. You're looking for a grade that won't damage the surface you'll be working on and that can be erased easily. Personally I opt for a 2H as it works FOR ME, but choose a grade that will work for the type of pressure you're likely to apply while using it. To hard and it will damage your surface, to soft and you'll have a tougher time while erasing. Rubber / Eraser - Many scribes swear by those blocky, hard rubbers you probably used in school, just make sure that it's white to avoid potentially marking the page. These can be purchased in a variety of places. I personally find those hard white rubbers a little weird to use and dislike them. 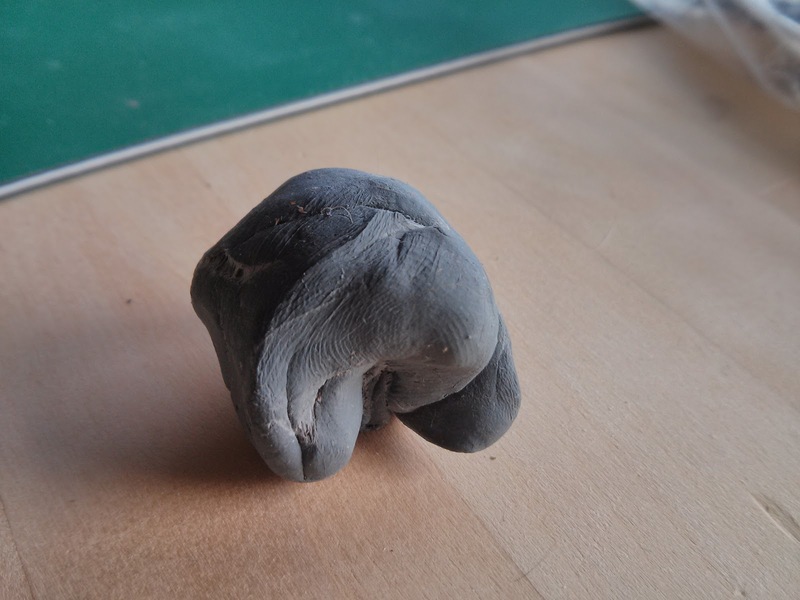 I tend to use what is known as a "putty rubber" or "kneadable eraser" as it works better for me. These are usually found near the pencil selection in the art store. Straight Edge - You'll need some sort of ruler to mark out your page and draw the lines you'll need for calligraphy. Rulers can be purchased in a variety of materials, lengths and styles. Personally I recommend that you buy one made out of metal as plastic and wooden rulers have the potential of being sliced by your craft knife, thus ruining the straight edge. If you can find one that has a cork backing even better, as this raises the edge off the page a little and helps avoid bleeding or smudging. 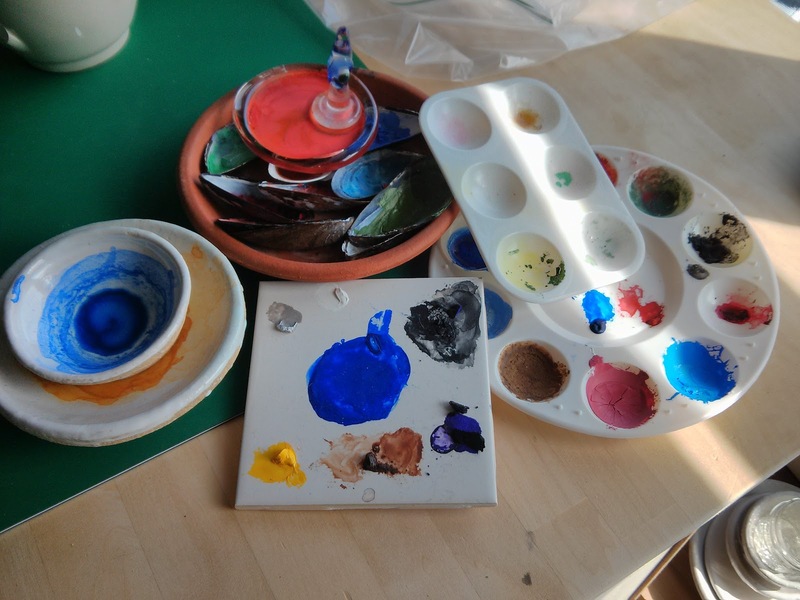 Paint Palette - Cheap, multi-well plastic palettes can be found at arts and crafts stores. However, you could also use a dinner plate, ceramic tiles, muscle (or other crustacean) shells, a glass ashtray or any other number of household items you probably already own. Other Random Supplies - Although you don't NEED any of the following supplies they're useful to have around. Distilled Water - I tend to use this rather than regular tap water to avoid the various additives combined at the treatment plants. One argument is that because it's "purer" it's closer to period water, but who knows if this is true or even really matters. Eye-dropper / Pipette - Found at pharmacies, they end up being very useful for adding very small amounts of water to your paints to thin them. Scalpel / Craft Knife - If you're buying the pads of Bristol paper you probably won't need a craft knife as they're already sized appropriately. However they useful to have around. Cotton Ear-Buds - Yes, the things you clean your ears with. They're actually very useful dipped in rubbing alcohol to clean your calligraphy nibs. 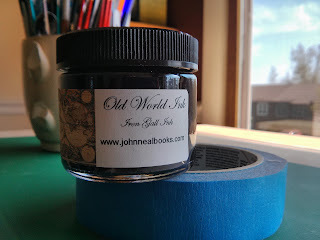 Rubbing Alcohol - As mentioned above, rubbing alcohol is great for cleaning your calligraphy nibs. Magnifier - Helps you not strain your eyes! 100% Talc - Wash your hands, dry them and then coat them in talc. It's stop your hands from sweating while you work. Scrap Paper - Rest your hand on some scrap paper while you work as it will protect the page you're working on from getting greasy and picking up smudges. Hands are dirty! Useful Links - There are numerous online resources for the things I have mentioned in this post, below are a few of the websites I find useful. Remember to check your local arts and crafts stores as many of these items can be found there.